Proper infusion of the Arts will create a STEAM culture that engages and promotes intrinsic learning. It actually is quite obvious that the Arts should be included in STEM education. The idea of STEAM brings out the skills of creativity, collaboration, critical thinking, and communication that are so important in the work place. A look at the works of Leonardo da Vinci will attest to this! The very first time I heard the idea of integrating the Arts into STEM education was while watching a keynote made by Daniel Pink at the NECC Conference in Washington DC… yes prior to ISTE Conferences! Pink presented strong evidence that educators must include right brain lessons in addition to the inclusion of historical left brain activities. A reading of his book, A Whole New Mind: Why Right-Brainers Will Rule The Future, is a must for any educator, especially those interested in STEM education. It is evident that inserting the A (Arts) in STEM and creating STEAM allows for true innovation, and it is innovation that will allow students to be successful in a flat world. Bringing the Arts to STEM allows students to remember the creative juices that come with the smell of a Crayola Crayon, the engagement of Tinker Toys, and the creation and remixing of that first Easy Bake Oven. It is the STEAM that allows students to not just be technology consumers, but technology creators! Proper infusion of the Arts will create a STEAM culture that engages and promotes intrinsic learning. In the space below I have included some sites that may just allow educators to integrate the Arts, allowing STEM to become STEAM! While there is a lot of talk on STEAM Education, it can be difficult to find a lot of material. I hope you enjoy what I have gathered and please let me know what I should include in an update post. Time to go full STEAM ahead! BabbleDabbleDo – This is a site that allows students to explore and engage with their right brain. This is important in our tech saturated world. This site provides that creative angle that puts kids in that out of the box mode while exploring concepts in science, math, and engineering. The site proclaims that the best part of creating is the process.And I truly I believe that EVERYONE IS CREATIVE. 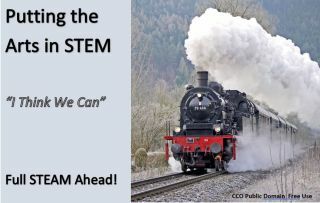 Teach Hub Technology and STEAM – Take a look at these possibilities for connecting standards, technology integration, and STEAM. Edutopia STEAM Resources – One of the finest education sites brings STEAM to the forefront. Enjoy this engaging journey. You will discover information, examples, and tools related to incorporating aspects of the arts, design, and the humanities into STEM-based school activities. Lemon Lime Adventures 50 STEAM Projects and Activities – Take some time to look through the various links on this page. You are bound to find some great possibilities that will fit your standards. Education Closet – This site supports teachers, leaders and artists using arts integration and STEAM education through world-class, comprehensive professional development and resources. Share Space Foundation – The ShareSpace Foundation is a 501(c)(3) nonprofit organization dedicated to inspiring children’s passions for science, technology, engineering, arts and math by providing innovative, interactive educational tools to educators across the country. ShareSpace has reached more than 250,000 children across the globe through strategic partnerships and the engaging Giant Mars Map™. Eurekus – This is a site with STEAM powered discovery. Discover the many free lessons that bring the left brain world alive in the the right brain. Left Brain Craft Brain – Discover this blog with great activities and possibilities to engage the whole brain in the engineering process. It is a self-proclaimed mega monster of STEAM posts. You will find some of the coolest science, technology, engineering, art and math projects from some of the most creative bloggers out there. How To Smile – This is an amazing collecting of some of the best educational materials, learning activities, tools, and services. They are all designed especially for those who teach school-aged kids in activity-based settings. This site is sponsored by a group of science museums dedicated to bringing science, technology, engineering, and math (STEM) out of the academic cloister and into the wider world. This is a great place to Make STEM happen! New York Times Lesson Plans – I include this because you will find a collection of amazing lessons that cross all areas. Best of all, they bring the creativity and innovation into these lessons which is the foundation for the arts. Art in Action – Take a look at these mini Art lessons that allow students to get in that right brain frame of mind. PBS STEM Collection – PBS Learning Media has great resources. Check them all out. This link brings you to the STEM Collection. Project Pals – A great article that looks at STEM/STEAM possibilities in the world of PBL for all grade levels.